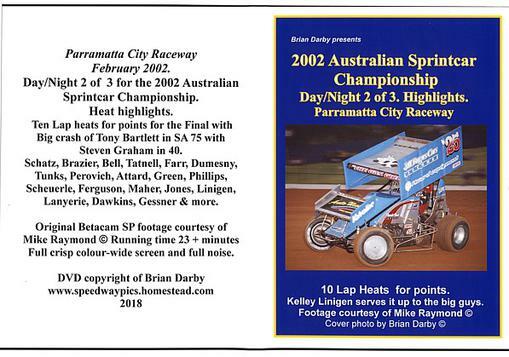 As a photo/ journalist for many years for a Speedway publication I shot many thousands of Sprintcar, Speedcar, Solo & Sidecar photos at Parramatta City Raceway, Newcastle Motordrome and Gosford Speedways over the years 1995 to 2004. I have now scanned many hundreds of the negatives of those photos and am embarking on a series of top photos, put on DVD using great software, music, effects and titles for you to enjoy. All DVDs playable on most computers with Windows Media or Quick Time software and of course DVD players and TVs. 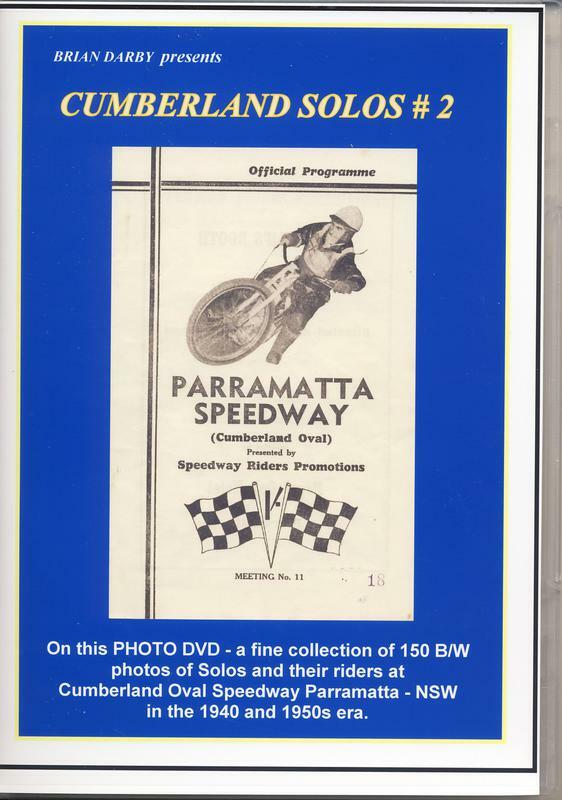 You also have the access to my many of thousands of vintage Speedway photos via these DVDs - bikes and cars. The first of my road racing photo DVDs. 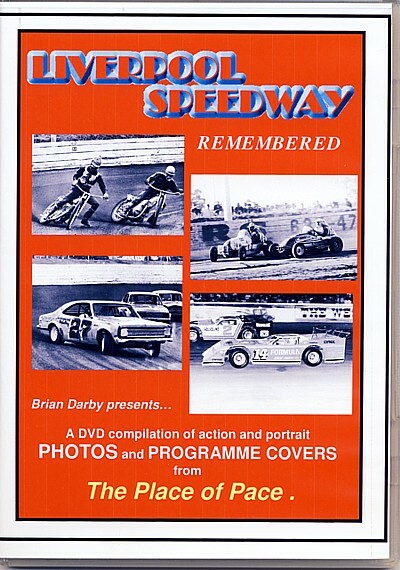 This DVD contains a large selection of B/W & colour photos from the lense of John Stanley. 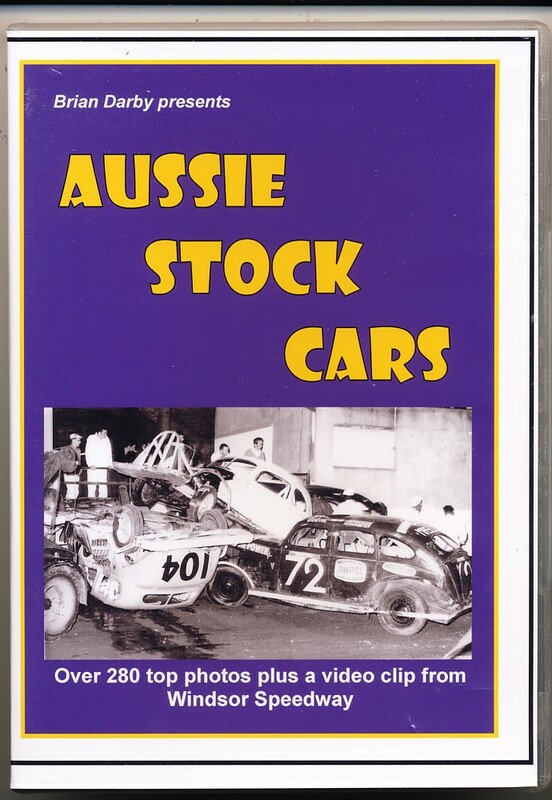 It covers Tasman cars in the 60s, top touring and sports cars of the day at Warwick Farm, Surfers Paradise and Lakeside and the cover pic at Sandown. A unique photo DVD video with music, titles, captions and transitions. 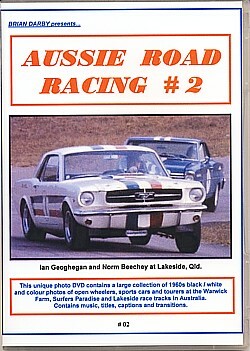 A bonus is a few minutes of rare video footage of Jack Brabham at Mt Druitt in 1953 in the silver blue # 8 Cooper HRD. A DVD-R disc, PAL TV compatible. The second in the series presenting the fabulous photos of John Stanley, with a mix of open wheeler, sports cars and tourers. 75 top b/w and colour photos with music, titles, captions and transitions. 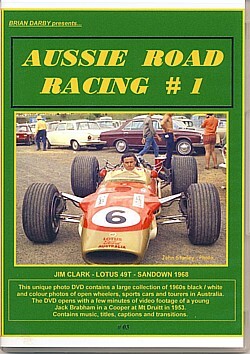 Open wheelers, sports cars and touring cars of the 1960s. 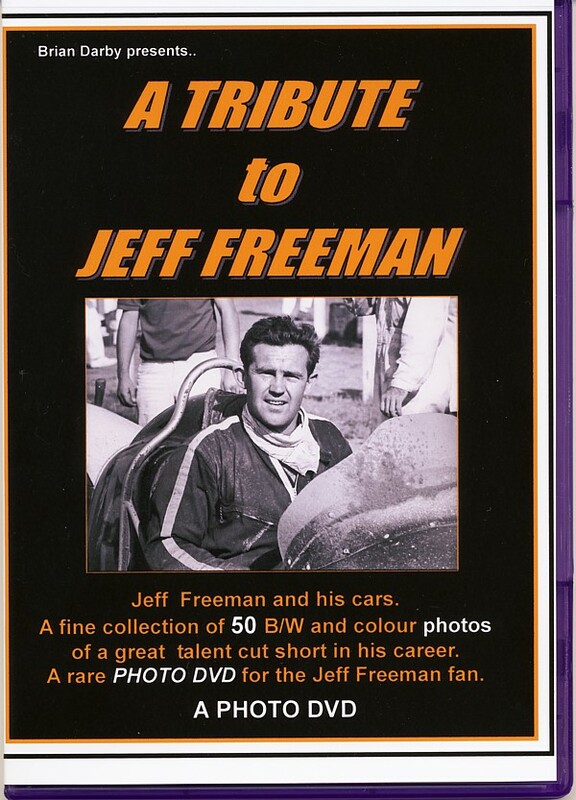 The DVD opens with a short sound track of a 250 F Maserati under acceleration and a pass of the microphone at speed. 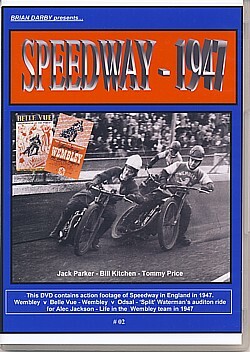 Action footage of some of the solo greats of the 1940s in the UK. Wembley vs Belle Vue - Wembley vs Odsal Split Waterman's audition ride for Wembley team Manager Alec Jackson - and behind the scenes at Wembley - The Team & The Stadium in 1947. One for the solo enthusiast of old. 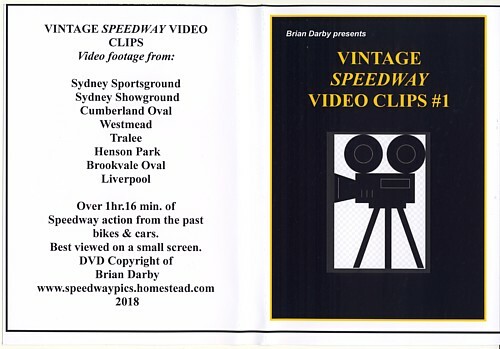 In 1996 the members of the Veteran Speedway Riders Association of Australia had two days out with their restored bikes for some track action. I was there to video those days. 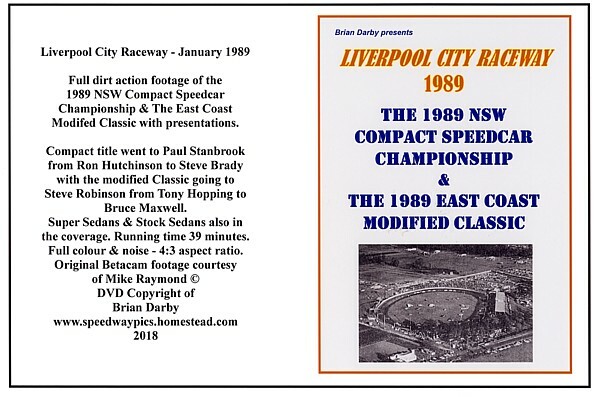 The days were held at the private Mulbring track ( out of Cessnock ) and the Barleigh Ranch Speedway, just out of Raymond Terrace. NSW. At Mulbring Phil Herne, Stuart Mountford and Gary Guglielmi put on some fine riding displays and Mountford, Herne and the Shields brothers, Dave & Brian, strutted their stuff well at Barleigh Ranch. 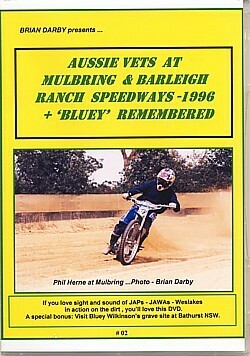 A little 3 min bonus is a trip to Bathurst Cemetery to view the final resting place of Speedway legend, Bluey Wilkinson. Running for approx 45 mins, if you love the sight and sound of J.A.P.s, JAWAs and Weslakes you'll love this footage. Price: $ 25 ea. Aud + $3 p&p within Australia. AS THEY ARE (or WERE ) after SPEEDWAY. 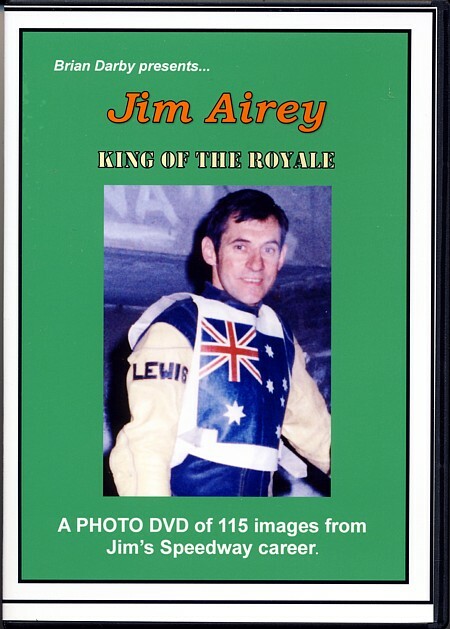 A photo DVD containing over 90 top quality colour photos of some of our veteran Speedway riders and their International guests at Re Union Dinners and outings in their later years after their Speedway careers. 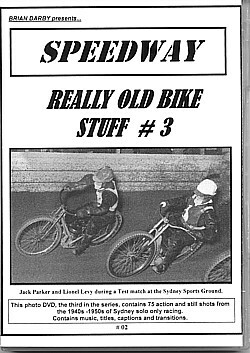 See some very famous faces and names and maybe an old mate or hero from those golden days of bike Speedway. Contains music, captions and transitions. 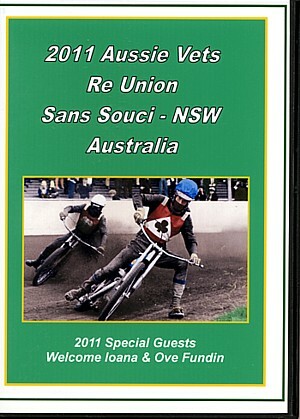 $ 40 Aud + $5 P & P (within Australia) for both the AS THEY ARE and the AUSSIE VETS DVDs. 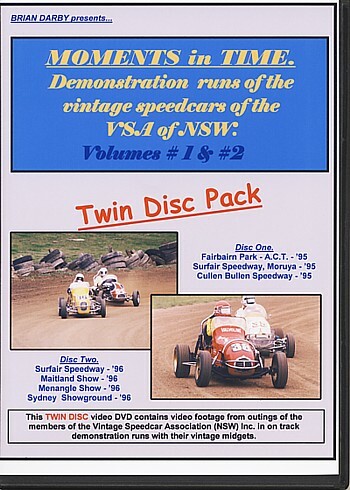 A unique TWIN PACK photo DVD containing 300 top quality digital colour photos shot at the 2005 Vintage Speedcar Spectacular at the Brisbane Exhibition grounds. 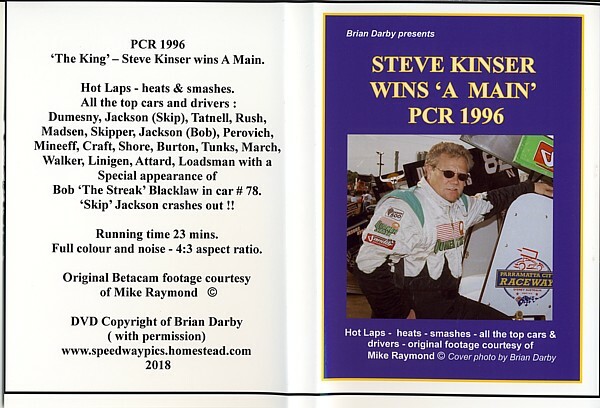 Great shots of that legend Mel Kenyon driving the SESCO V8 Suzuki and Don Meacham in the Vercoe Chev II, plus a coverage of most of the other cars and drivers on the day. 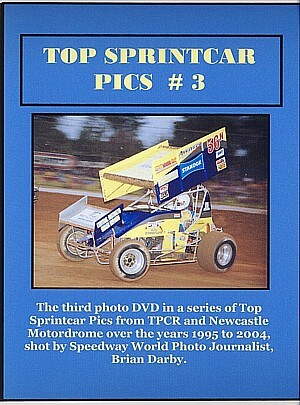 TOP SPRINTCAR PICS - PHOTO DVDs. #s 1,2,3,4 & 5. On average 100 top colour action and still photos on each disc. All original and unique photos. 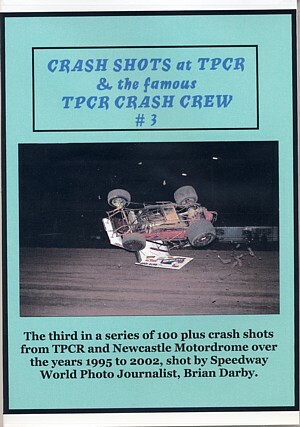 Shot at PCR & Newcastle Speedways over the years 1995 to 2004. Each DVD has music, titles etc. 100 colour photos ( av.) on each disc, crash, spin and recovery pics with music titles etc. I'll run these out at @ $ 20 each +$3 P&P until sold or $ 80 for the four discs. 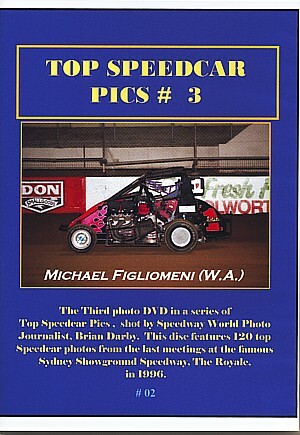 TOP SPEEDCAR PICS - PHOTO DVDs. 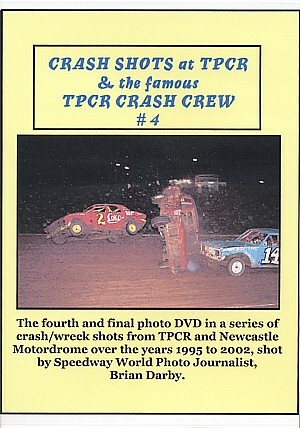 Av of 100 top colour photos on each disc, from TPCR and Newcastle, The Royale - years 1995 to 2004. Tony Stewart pics on # 1 and a few laps of video action on # 2 of Mark Brown and Daryl Beattie at TPCR. 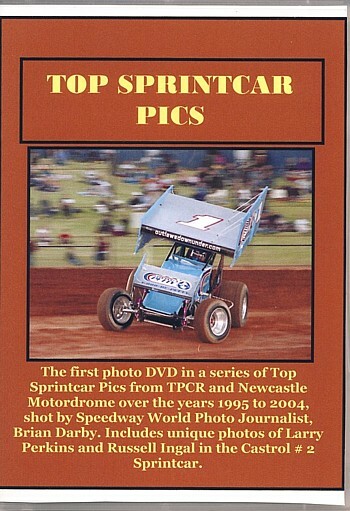 An extensive collection of top colour photos of Solo Speedway 1995 to 2002 at Gosford, PCR, The Royale, Bathurst Long Track and Bankstown Long Track. $25 Aud + $3 P & P within Australia. 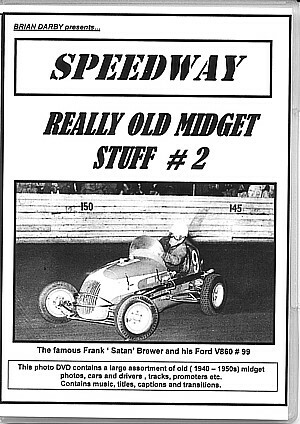 REALLY OLD MIDGET STUFF - PHOTO DVDs. 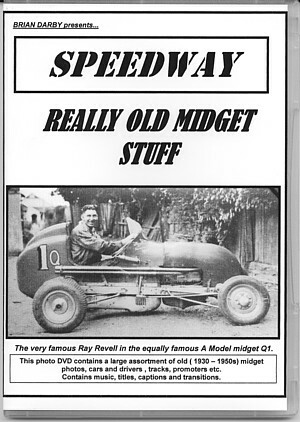 They cover Sydney midgets from 1938 to the late 50s. 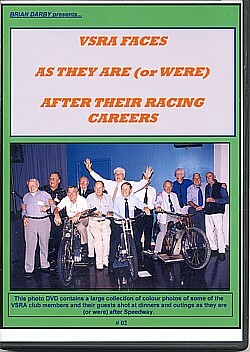 REALLY OLD BIKE STUFF - PHOTO DVDs. 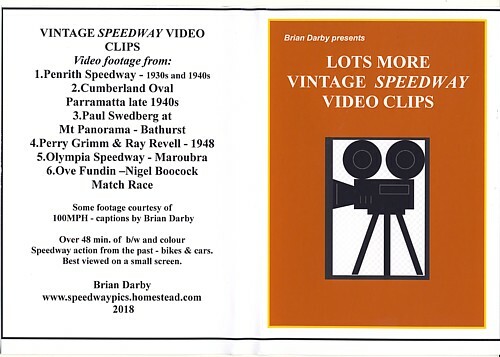 Covering solo and sidecar competitors on Sydney tracks from 1928 through to the late 50s. music, titles etc. Some very rare photos. $25 Aud each + $3 P & P (within Australia) or $ 60 Aud plus $5 for all three in the set. 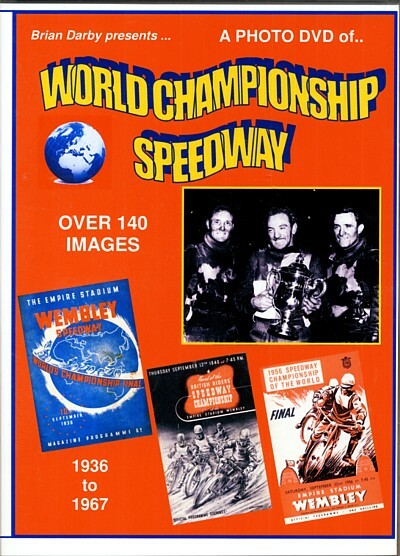 Got a favourite Speedway competitor ? Want a photo or two ? I may just have what you want. Email me with your request - Realistic prices. 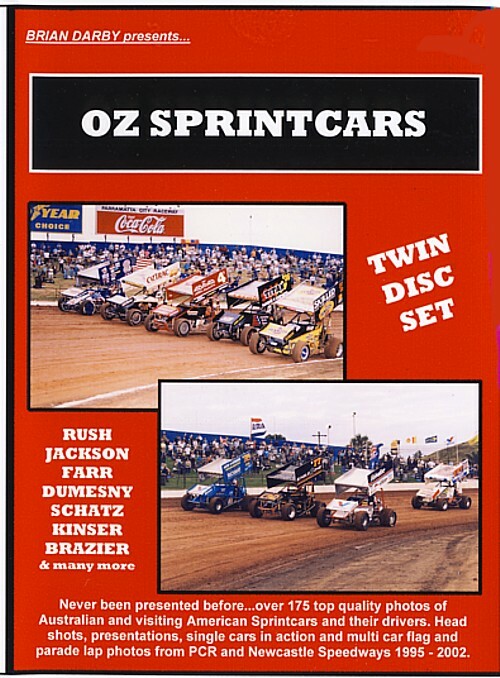 OZ Sprintcars - A TWIN DISC set PHOTO DVD/s of 175 top quality photos shot at PCR and Newcastle Speedways over the years 1995 to 2002 by Speedway photo/jounalist Brian Darby. Has music, captons, titles, transitions. All original photos, never been published on DVD before. 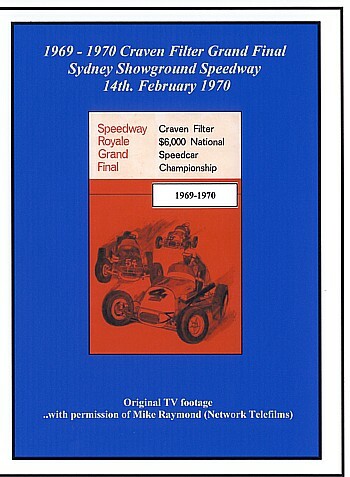 Now I can present by permission of Mike Raymond of Network Telefilms Actual Footage from the Sydney Showground Speedway in the 60s & 70s in the form of some of the Craven Filter Grand Final races, as televised. $ 25 Aud + $ 3 P & P within Australia. $ 25 Aud + $ 3 & P within Australia. 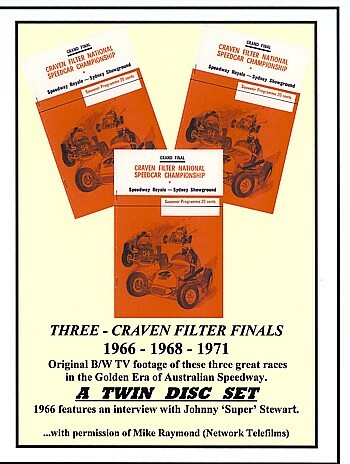 A TWIN DISC Set of three of the Craven Filter Grand Finals from the Royale -1966 - 1968 and 1971. $40 Aud + $3 P & P within Australia. 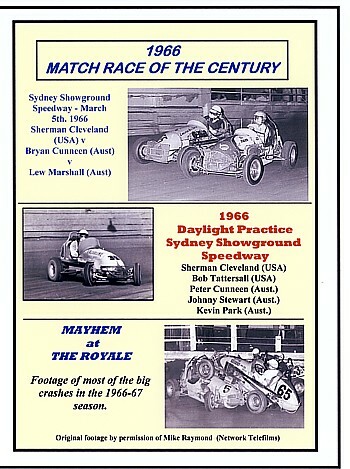 Match Race of The Century - 1966 Practice Day - Mayhem at The Royale - Three really choice clips of Aussie midgets at the Sydney Royale - A lot of action ! $ 25 + $3 P&P within Australia. 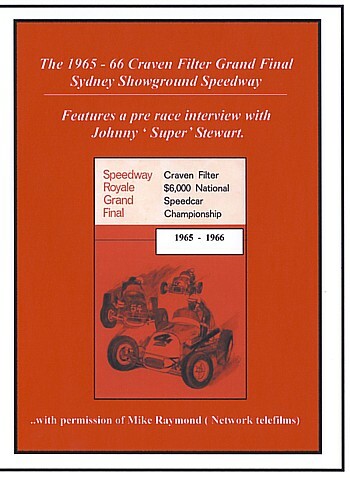 Sydney Showground Speedway between 1956 and 1968. I can now present these PHOTO DVDs with permission of the Taylor Family. NEVER BEEN AVAILABLE IN THIS CONVENIENT FORM BEFORE. Each disc has a music background, titles, photo captions and transitions. You can pay with Credit Card with Pay Pal. It's quick safe and easy with Pay Pal.. Please contact me for a Pay Pal invoice. 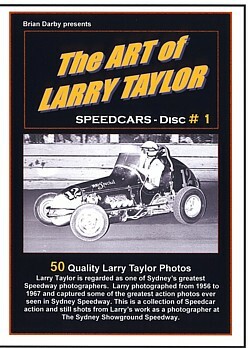 50 photos of midgets and their drivers from the famous Cumberland Oval Speedway Parramatta in the 1940 and 1950s era. Never been presented before in this format. 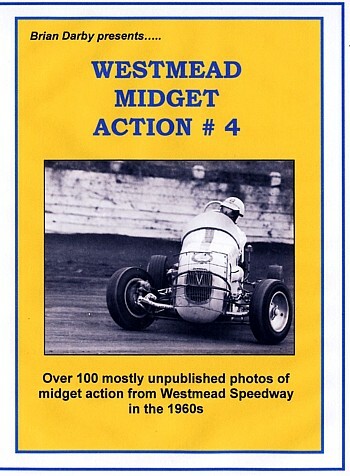 One for the true midget fan. 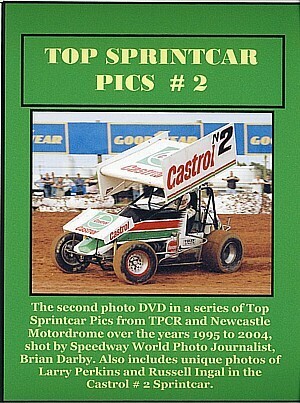 DVD has titles, captions, facts, music background and an aerial view of the old track. A DVD-R disc in the PAL format. 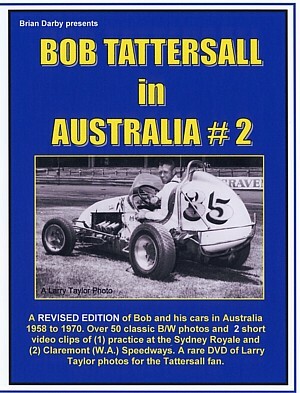 After having to revise my original edition of this interesting PHOTO / ACTION DVD, I can now present this DVD of over 50 classic photos with 2 short video action clips, one of daylight practice at the Sydney Royale in B/W and one of daylight practice with Bob Tattersall and Sherman Cleveland at Claremont Speedway W.A. in colour. 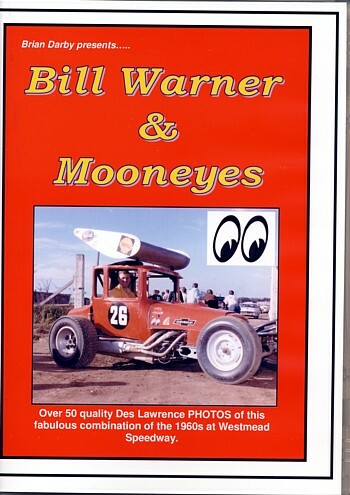 It also contains some current colour photos of some of the now restored Offies which Bob drove here in Australia. The Magic of Des Lawrence. 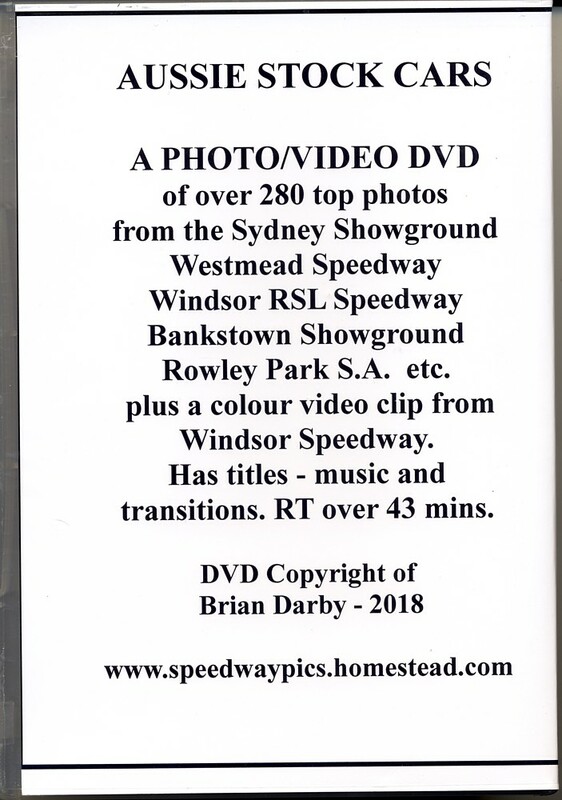 I present with the enthusiastic support of Mrs Rita Lawrence, Des' widow and the late Jim Shepherd - two fabulous PHOTO DVDs of midget cars and their drivers in posed shots on the #1 DVD and action shots on the # 2 DVD, mainly from Westmead Speedway in the 1960s. Over 50 B/W and colour photos on the # 1 DVD and over 50 B/W shots on the # 2 DVD on these, the first two of the Des Lawrence DVDs I will present in coming months. 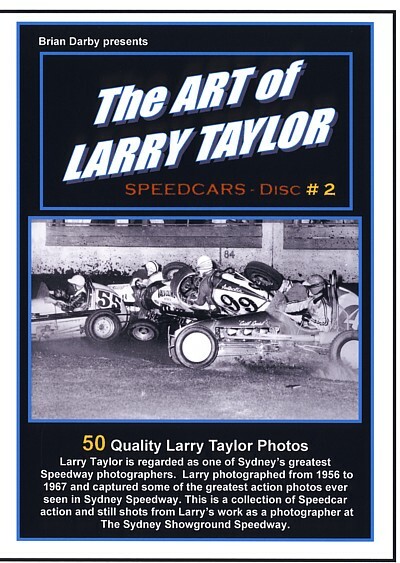 50 quality Larry Taylor & Des Lawrence photos (with permission) - from Jeff's colourful but much too short career. DVD has music - captions - titles - transitions and comes in a colourful DVD case. 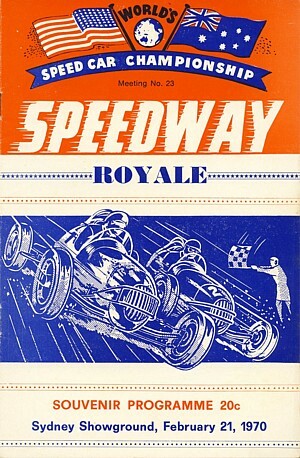 One for the traditional Speedway lovers. Ken Le Breton, one of Australia's greats in International Speedway Solo racing in the late 1940s and early 1950s. 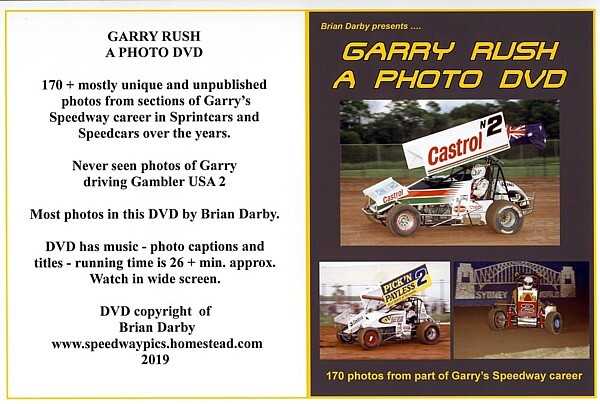 This PHOTO DVD contains many photos from Ken's career here in Australia, England and Scotland, most photos never published or seen in Australia before. 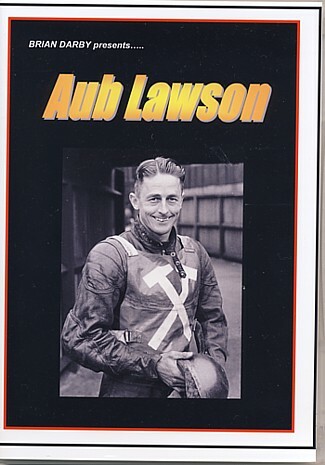 He was a Test rider for his country, had a huge fan base in Scotland, was placed 13th in the 1949 World Solo Speedway Championship at Wembley and was regarded by many as a future World Champion. 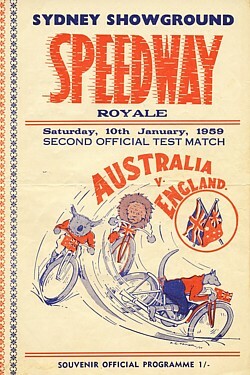 It was not to be, Ken lost his life in a racing accident at the Sydney Sportsground Speedway on 5th January 1951 during the final stages of an England vs Australia Test match. This DVD has music, titles, captions and transitions. 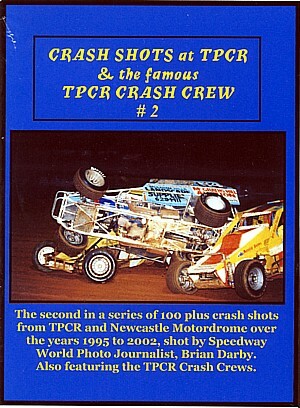 A must addition to your home Speedway Library. U.K. photos courtesy of The John Somerville Collection. "Must say you have done a very, very good job, thanks again for sending." 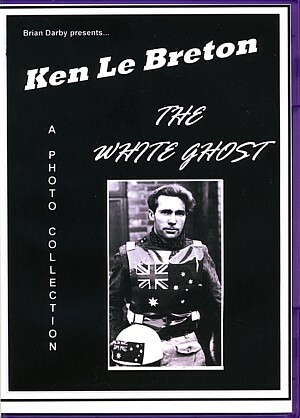 'Ken Le Breton - The White Ghost"
Tributes to four of the greatest midget drivers to drive Australian Speedway tracks in the 1960s. 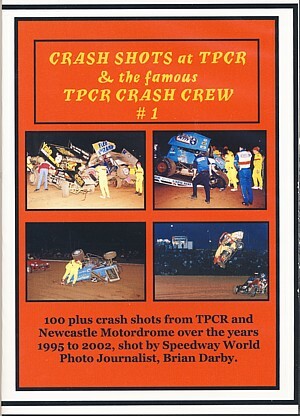 Over 200 quality photos plus video footage, some never published before. as against buying the separate tribute DVDs. A great Birthday or Christmas present. Overseas postage $ 9 Aud. 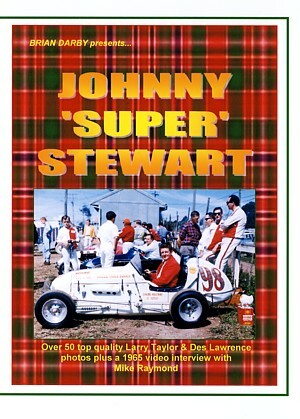 Over 50 quality photos and a video interview of John by Mike Raymond in 1965.
of Len and his cars. owner / driver in the 1960s. 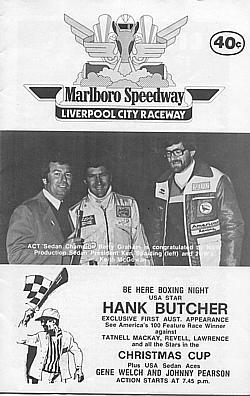 Photos from The Royale, Westmead, Windsor, Cumberland & Liverpool Speedways. 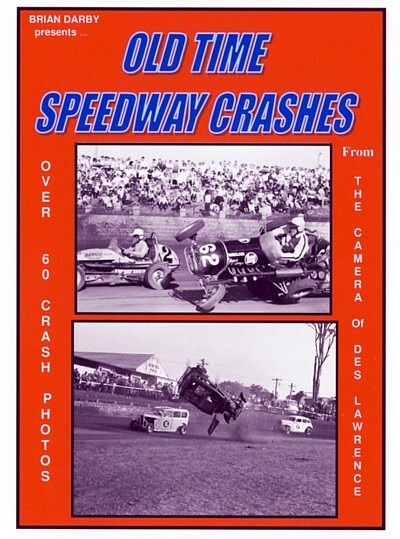 Cars - cars & drivers - action- multi car action and crash shots - it's all there in a collection of 250 B/W photos on a TWIN DISC SET. Photos by Larry Taylor - Des Lawrence - Warren Bridge ( with permission ) and some of Don's personal photos. 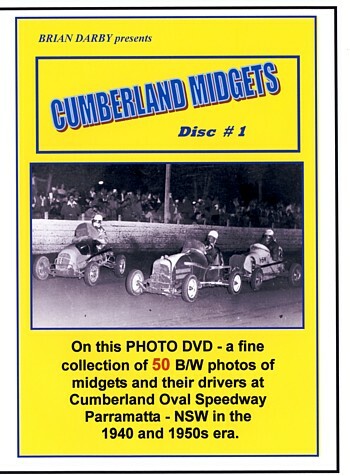 There has never been a photo DVD of this variety of 1950s & 1960s midget racing in NSW. 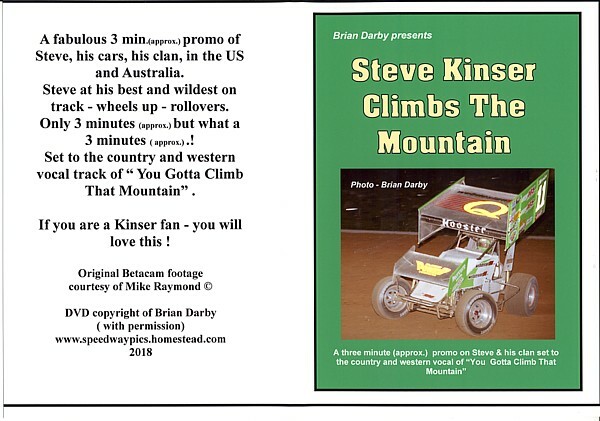 The DVD has titles - captions - music and transitions. Don's own comments and dates with most photos. A huge effort to create but the outcome is really worth while. Produced on DVD - R discs. Quote:"Just finished watching the DVD , excellent, feel humble, no mistakes. Much praise for your work for Speedway. Don & Anne Read "
$ 40 Aud + $ 3 P&P within Aust. Solo Test Match with support Solo and Sidecar events. Veteran's parade and vintage Speedcar demonstrations. My photo coverage of this event - runs for 22.5 mins - has titles - captions - music - transitions. 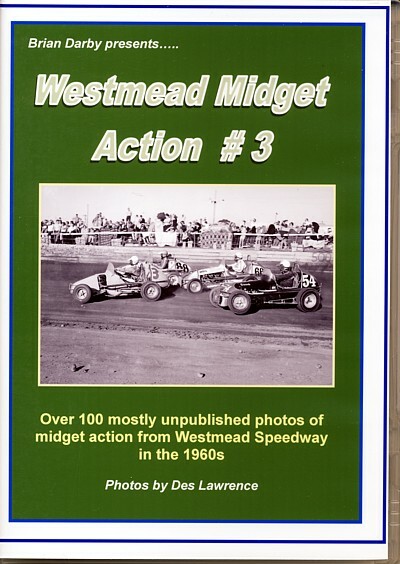 As I was also driving a vintage Speedcar on the night I missed taking photos of the vintage Modifieds demonstration. 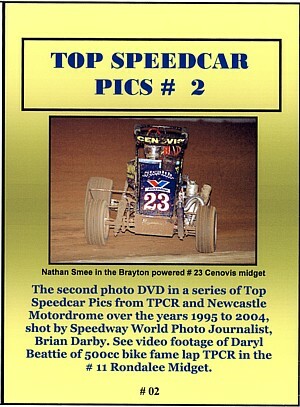 Sorry, no Modifieds photos on this DVD. Original programme cover by Benette Telfer. 70 classic photos of the riders, their bikes - action and still - has music, titles, photo captions and transitions. 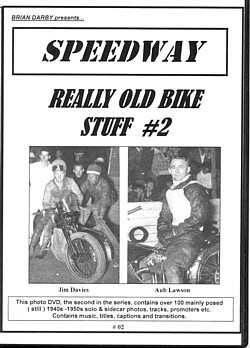 Davies, Speerin, Helback, Levy, Carruthers, Ratten, Hodgekiss, Bingham, Clarke, Martin, the Adlam Bros. and many more. a pictorial form as you have never seen before. Never has a presentation of this type and quality been offered to the serious Solo fan in the past. 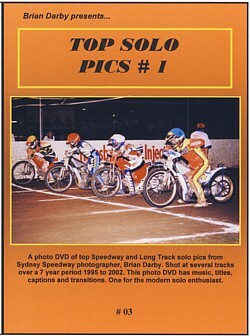 Available only from my catalogue of Speedway DVDs. and VSRA Memories - Photo & Video. of each year ( 1936 to 1967* ). ( Scotland) and Mike Kemp of the U.K.
Has music, captions and transitions. * 1966 Programme cover not shown. 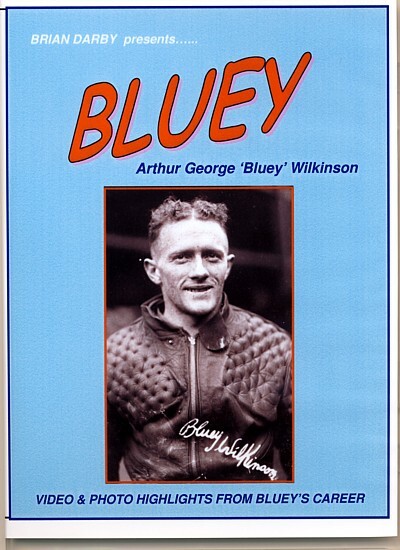 A video / photo DVD of 79 rare photos and a short 1938 action video from Bluey's career. DVD has music - titles - captions - transitions and runs for 27 min. 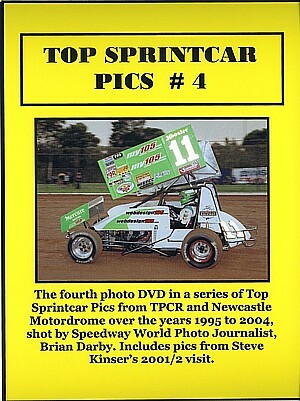 A DVD of 180 + photos and programme cover scans - of most classes to run at the Speedway. Runs for 40 minutes approx. with music - titles captions and transitions. 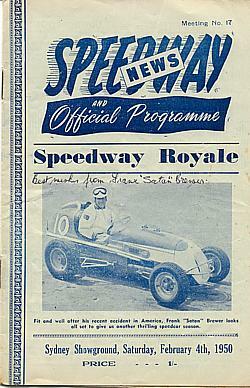 A great record of the Speedway's history. 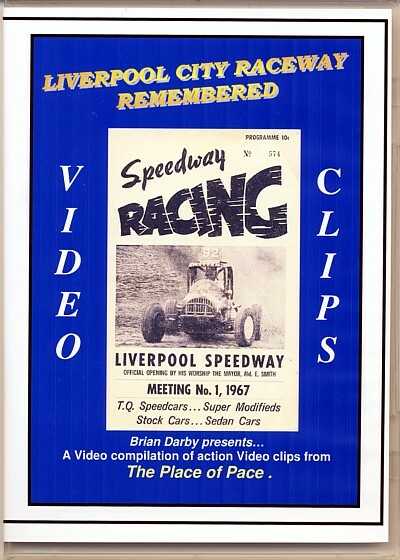 A compilation of video clips from the Speedway's history over the years - most sections ( no 500s ) colour and B/W footage - inteviews. Runs for 41 minutes approx, some footage not published before. Has music - titles- captions and transitions. his cars - his drivers. Now available for you to purchase. Max's cars and drivers over the years. and runs for approx 17.5 minutes. One for the Stock Rod - Hot Rod and Modified fan. 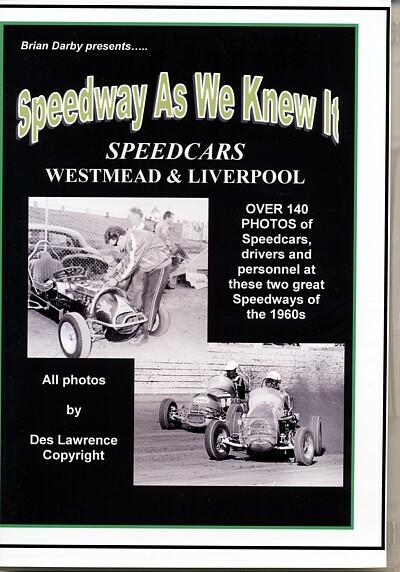 Over 100 action photos from Westmead - Liverpool and Windsor Speedways. $ 30 Aud + $3 P&P. 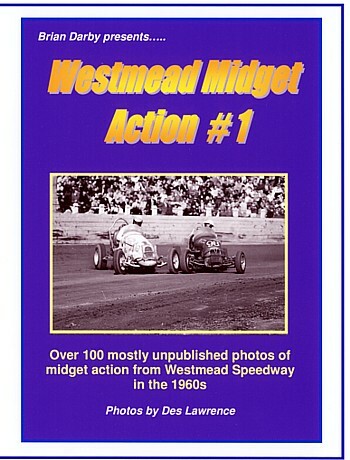 Over 100 midget action PHOTOS from Westmead Speedway - NSW - Australia in the 1960s - all the top guns and cars. 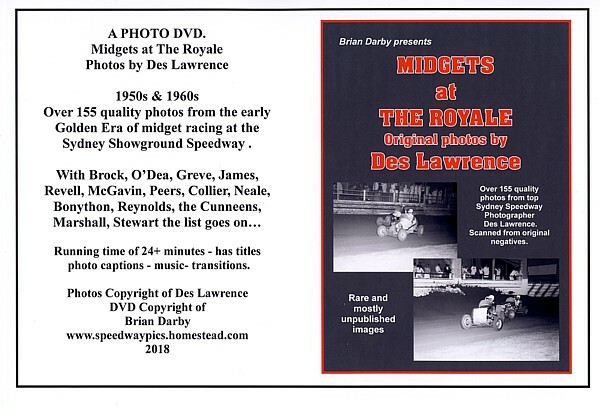 A PHOTO DVD of mostly unpublished Des Lawrence photos - has music- transitions - and title. 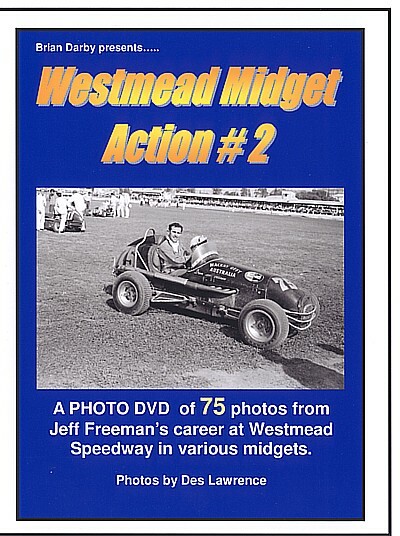 75 PHOTOS of Jeff Freeman (only) during his racing career at Westmead Speedway - NSW - Australia in the 1960s - A PHOTO DVD of mostly unpublished Des Lawrence photos - has music- transitions - and title. 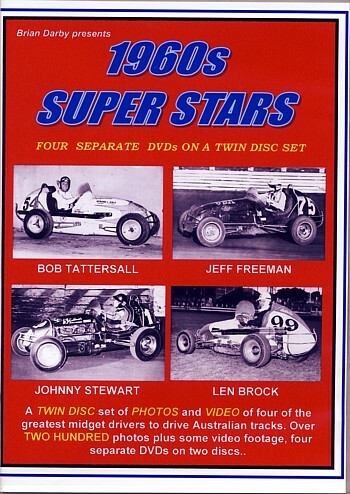 in a twin DVD pack. 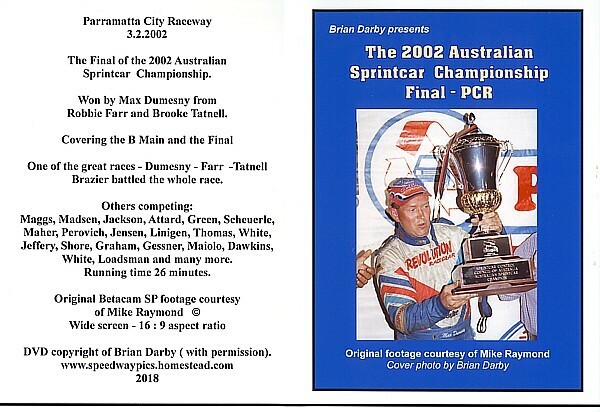 A fine collection of photos of our pioneer Speedcars and their drivers - not everyone's 'cup of tea' - but it IS the early history of Speedcar racing in Australia - one for the purists. A great presentation with old style background music to suit. 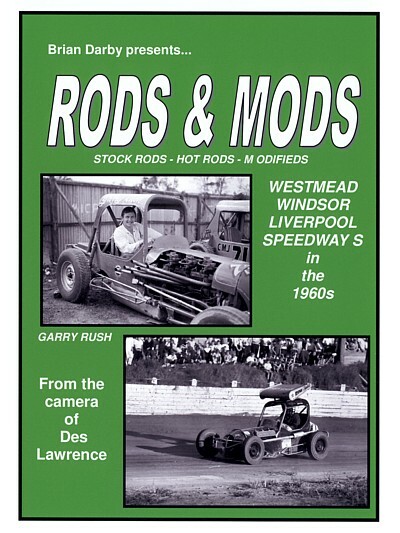 A chance for you to enjoy the many 140 odd many unpublished photos from the midget ranks at Westmead and Liverpool Speedways in the 1960s. 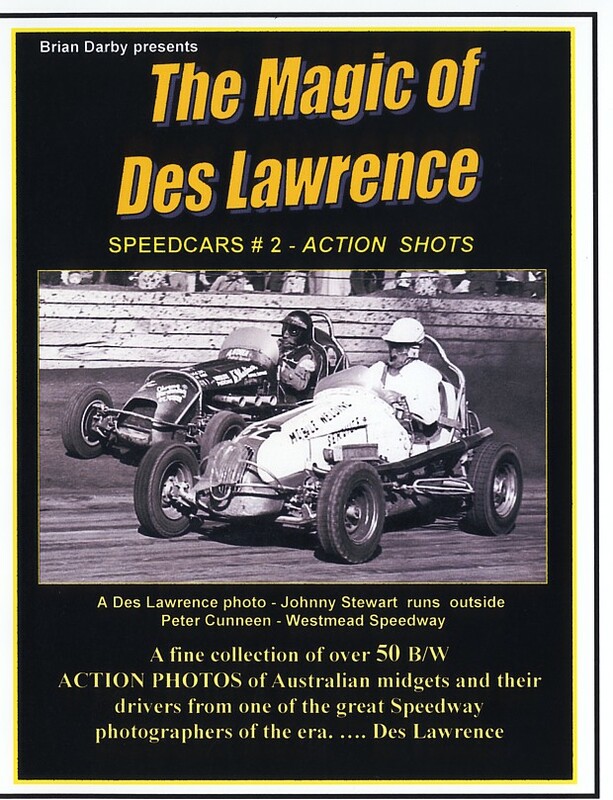 Over 100 mostly unpublished Des Lawrence PHOTOs of great midget action from Westmead Speedway in the 1960s. 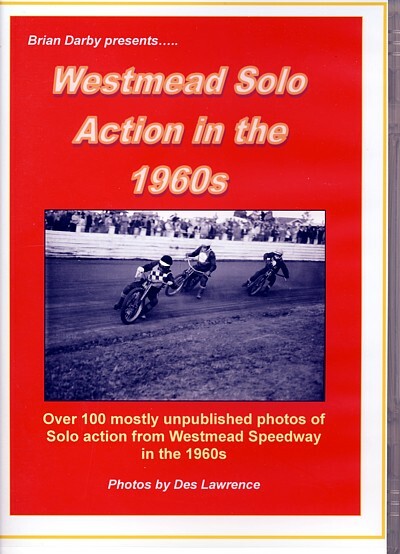 Westmead Solo Action in the 1960s. 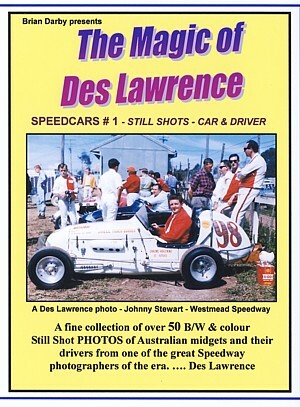 Des Lawrence at Westmead Speedway. 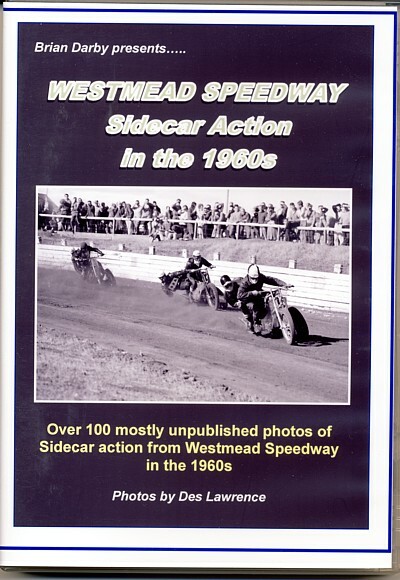 Westmead Speedway - Sidecar Action in the 1960s. 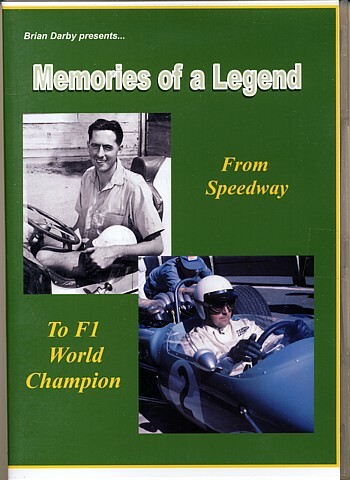 Follow some of the career, mainly in Australia, of the legendary Sir Jack Brabham. 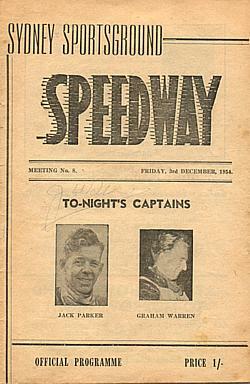 From his start in Sydney Speedway in the 1940s through his early road racing career in Australia. 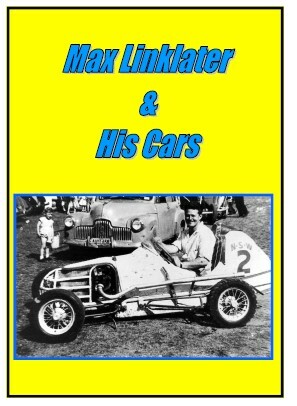 With several overseas candid photos and a short video clip of the then just 'Jack' at Mt Druitt NSW in 1953. Runs for 22.5 mins approx with over 80 photos. 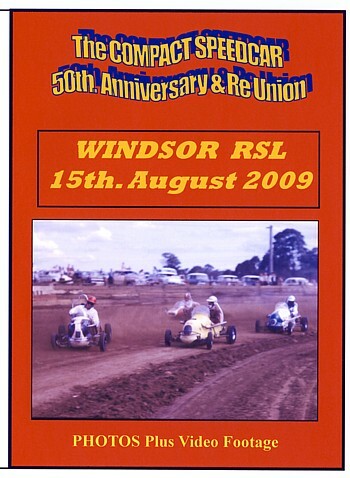 50th Anniversary - Vintage Compacts at Windsor RSL - A DVD with photos and colour footage of Compacts & TQs at Windsor RSL Speedway in the 1960s. 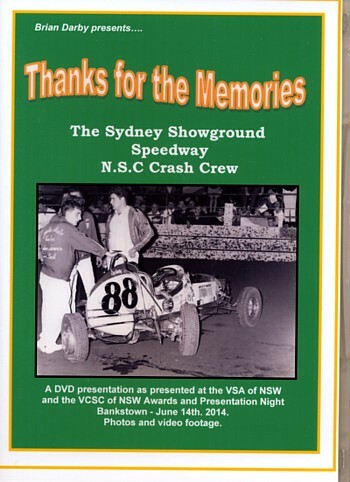 The DVD presented at the 2014 VSA and VCSC of NSW Awards & Presentation night at Bankstown Sports Club on June 14th as a tribute to the Sydney Showground Speedcar Crash Crew of the 1960s. Photos and video footage of crash action at The Royale. 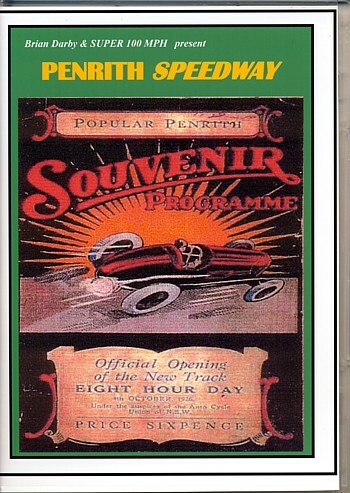 A tribute to one of the greatest Speedways of all time - The Sydney Sports Ground Speedway. 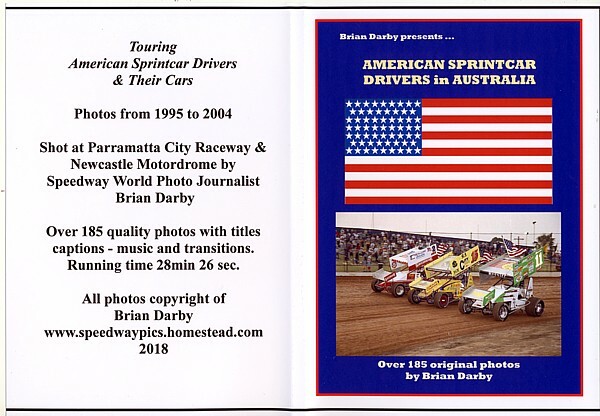 A triple DVD disc set - Solos - Sidecars -Speedcars - a disc for each section - runs for 2.5 hrs - the Solos disc alone goes for 70 minutes - over 600 photos with some footage. Sounds expensive but well worth it - months in the making. 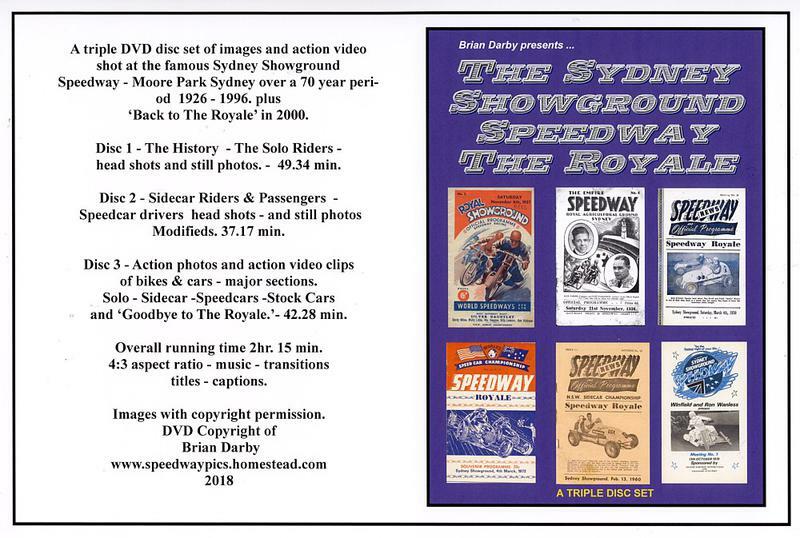 A PHOTO DVD of the cars and drivers contracted to Sporting Promotions at the Sydney Sports Ground Speedway in 1938. 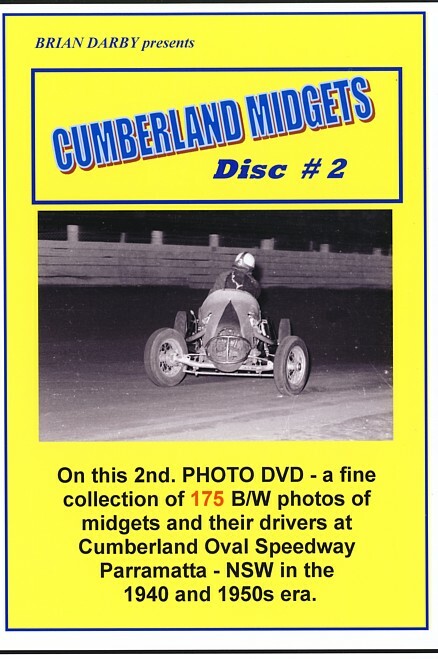 One for the purist and the inquistive fan of midgets. Many state & overseas titles. runs for approx. 20 minutes - has music - transitions - titles and photo captions. 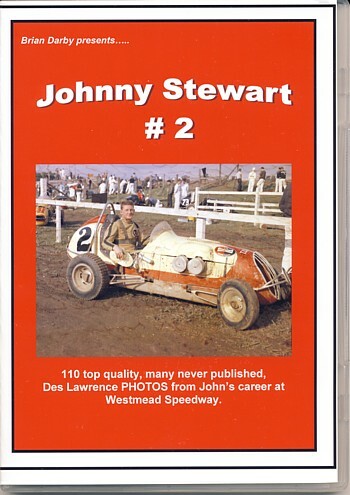 110 quality Des Lawrence photos from John's career at Westmead Speedway. A lot of unpublished photos - runs for 15.5 mins approx - has music and transitions. 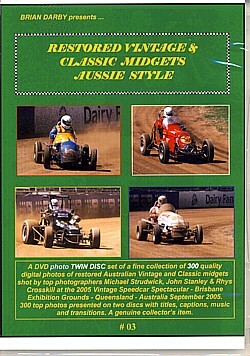 A PHOTO DVD of over 140 photos of air cooled twin engined midgets of the 1940s, 1950s and 1960s in Australia. 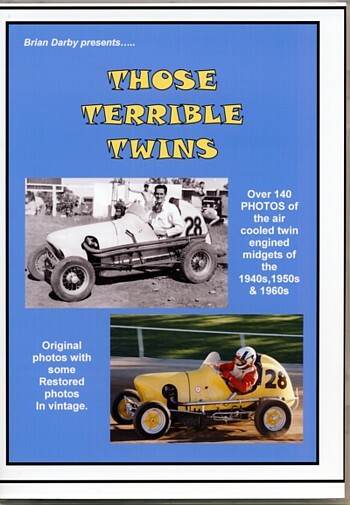 With a few photos of the restored cars in vintage. Runs for over 20 minutes, has titles, captions and transitions. 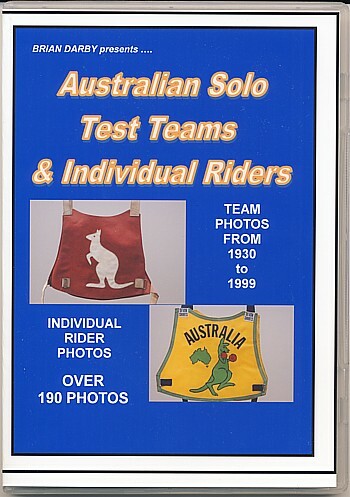 Over 190 photos of Australian Test teams and individual Aussie test riders from 1929 (unofficial test ) to 1999( unofficial test). One for the Solo enthusiast. 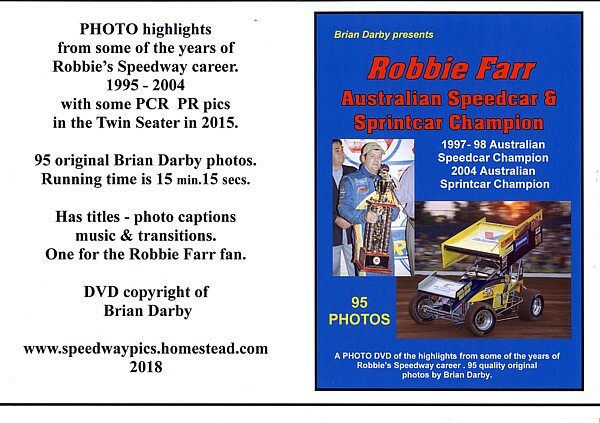 One of the great Aussie midget drivers. 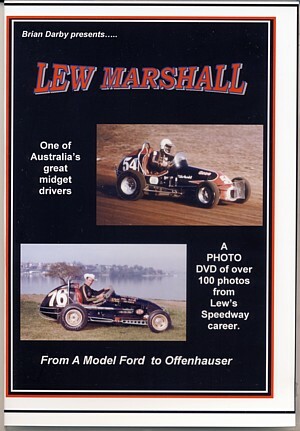 A PHOTO DVD of over 100 photos from Lew's career from his first car Q8, powered by an A Model Ford engine to the Morton Offenhauser # 72. 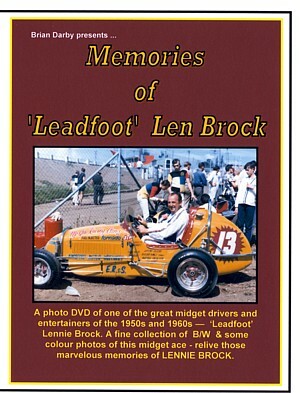 This DVD is a must for the Lew Marshall fan. 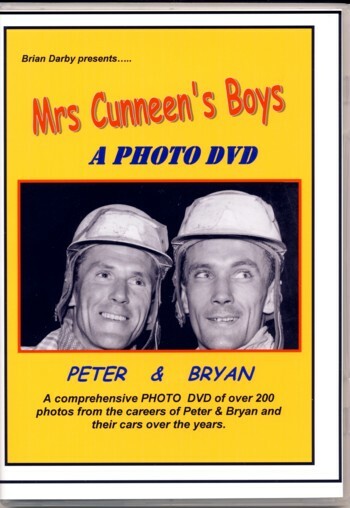 This PHOTO DVD has titles - captions - music and transitions. 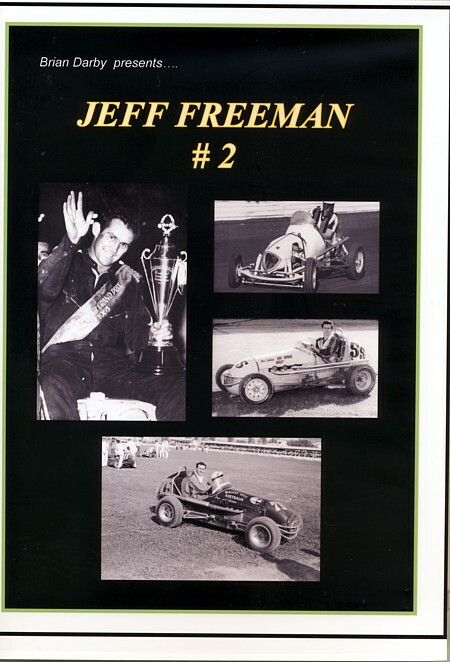 A true Speedcar driver legend. 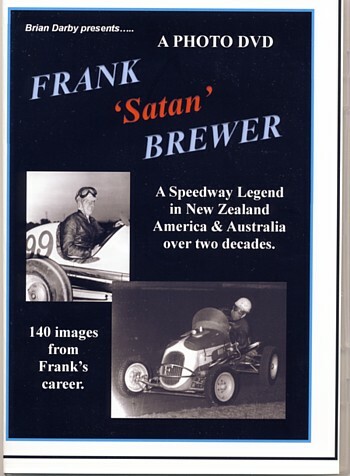 140 images from Frank's career in NZ in 1938 through America in the 1940's - Australia in the 1950s and into his retirement. $ 8.50 P&P for O/S. 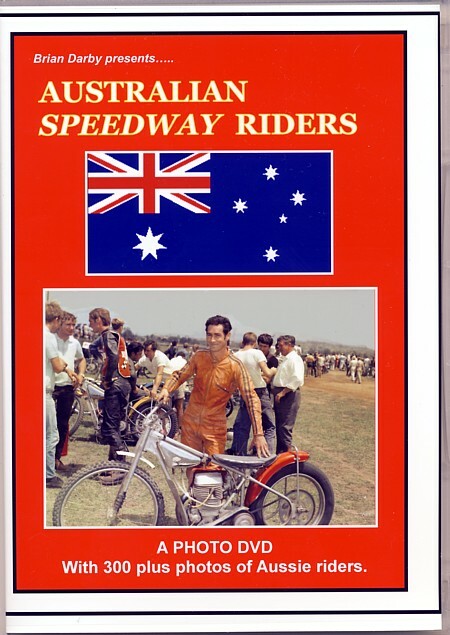 One of the all time great Speedway riders both in Australia and England. 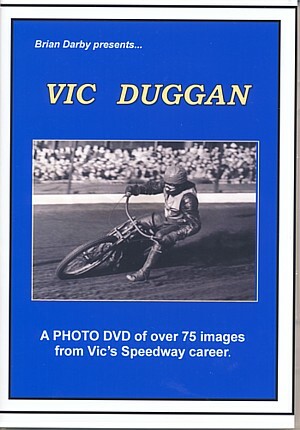 Over 75 PHOTOS from Vic's colourful Speedway career. One for the serious Solo fan. Has titles, captions and music. 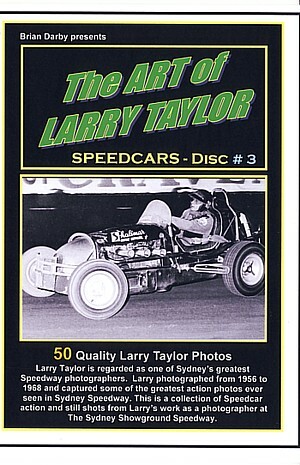 Often said to be Australia's greatest Speedcar driver. 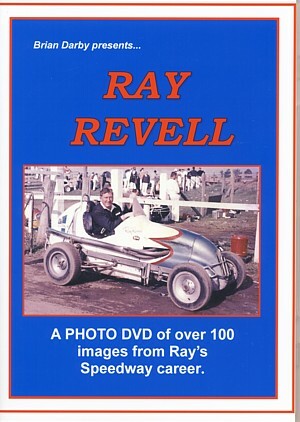 A PHOTO DVD of over 100 images from Ray's Speedway career both in Australia and USA. 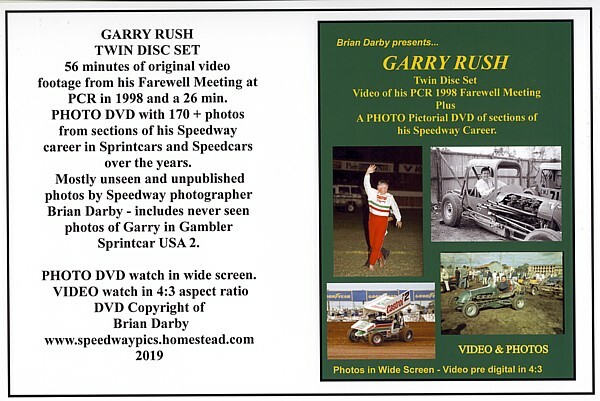 A PHOTO DVD plus a short video (courtesy of Geoff Davis ) of Lionel's last demonstration ride at Liverpool Speedway in retirement. 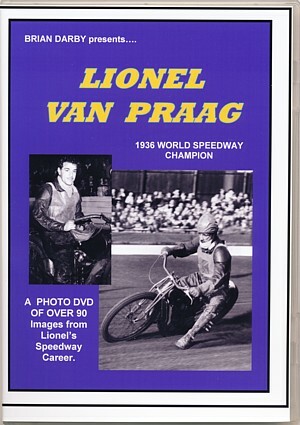 DVD has over 90 images from Lionel's Speedway career in the UK and Australia. Has music, titles, photo captions and transitions. 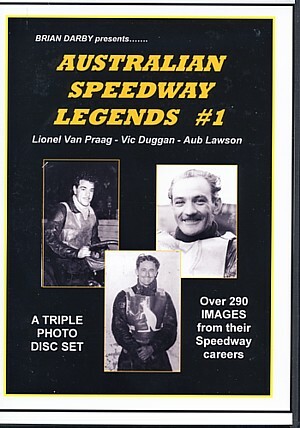 Buy the three Legends on a Three Disc set and save. Lionel Van Praag - Vic Duggan - Aub Lawson. 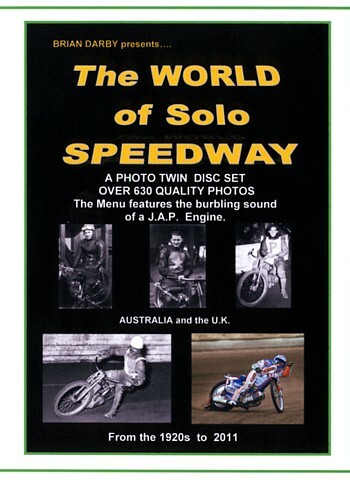 A PHOTO DVD of over 290 images from their Speedway careers in England and Australia. I can now supply one DVD or multiple DVDS on USB Memory Sticks. Any of the above DVDs is / are now available on USB memory sticks. 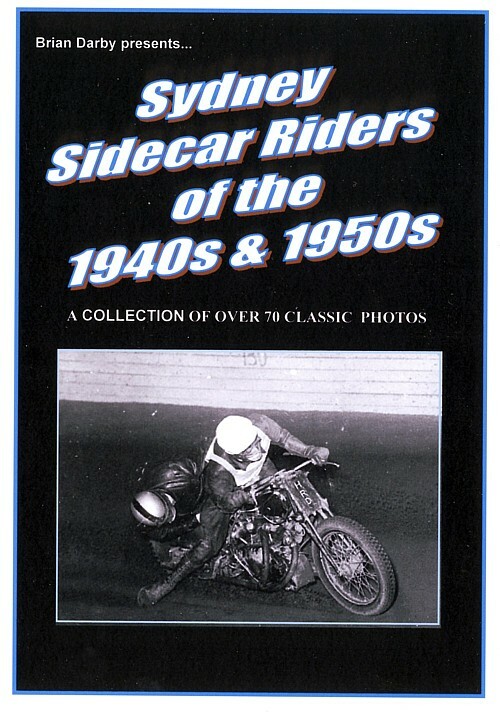 A fine and varied collection of over 200 photos from several eras. 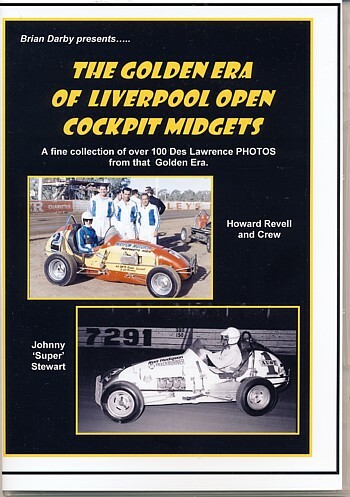 The Golden Era of Liverpool Open Cockpit Midgets. 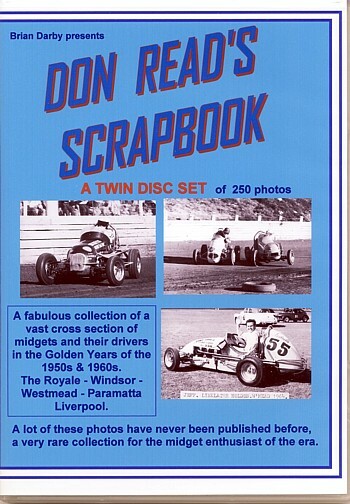 Over 100 photos from the camera of Des Lawrence of most of the top Speedcars and drivers at Liverpool City Raceway in the 1960s. 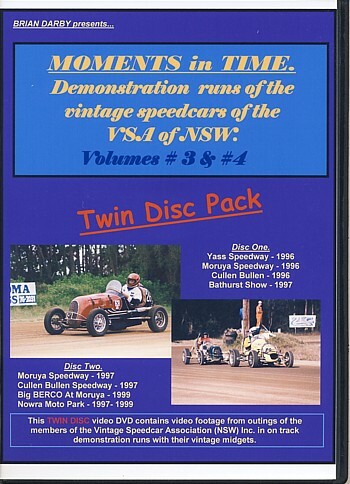 Want to see a lot of the famous old Speedcars in action again - in vintage demonstrations ? 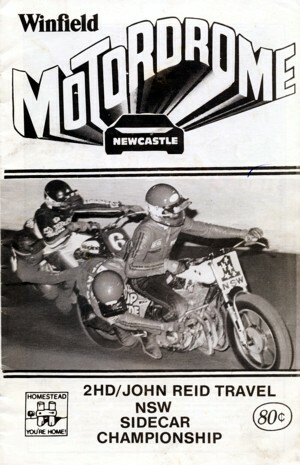 Nowra Moto Park, Brisbane Ekka, Wagga Wagga Showground. Over 5 hours approx. of visual enjoyment and sound of these old cars in non competitive action. From original analogue 8 mm footage. 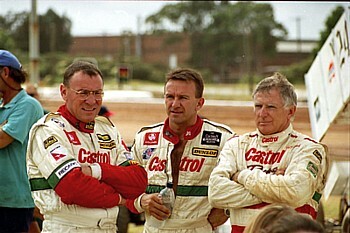 One for the S.A. Speedway fans of old. in the 1940s & 1950s. 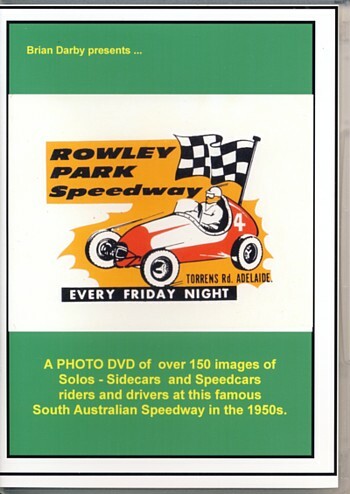 Or the two - Rowley Park & Kilburn DVDs for $ 45 Post Free ( within Australia) - Save $ 11. 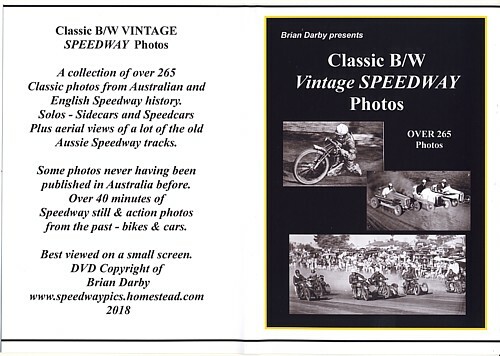 175 photos of midgets and their drivers from the famous Cumberland Oval Speedway Parramatta in the 1940 and 1950s era. The 2nd. in this series. One for the true midget fan. 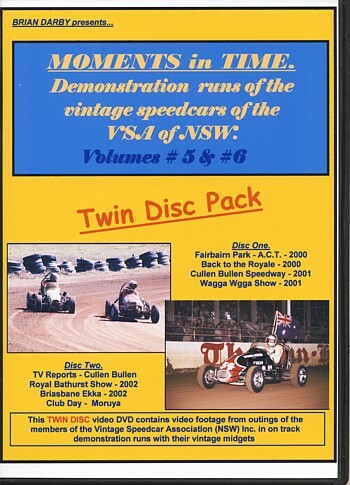 DVD has titles, captions, facts, music background and an aerial view of the old track. 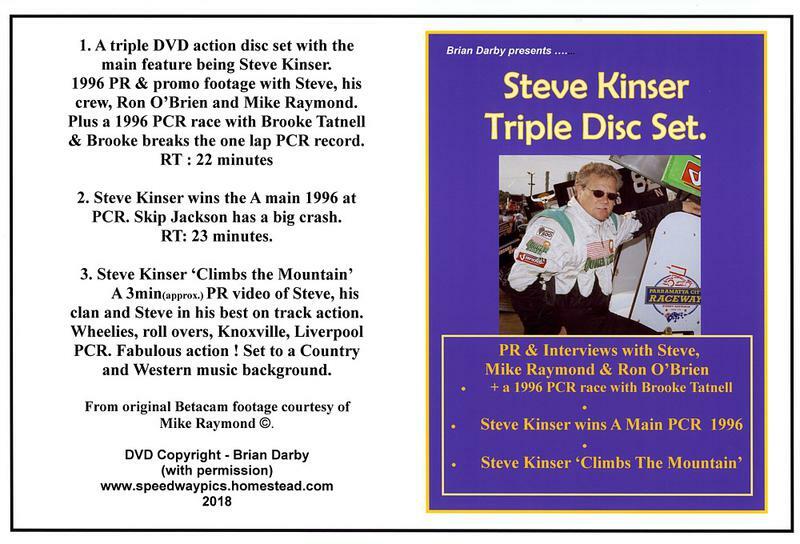 A DVD-R disc in the PAL format. 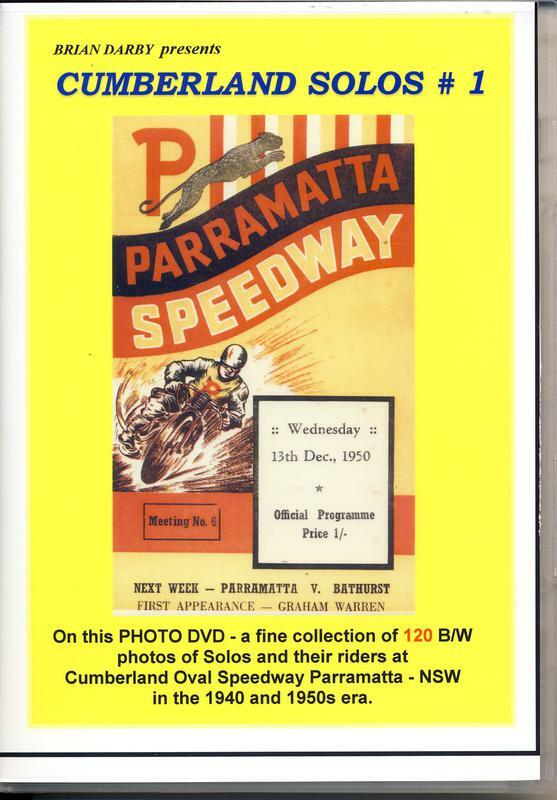 120 photos of Solos and their riders at Cumberland Oval Parramatta - in the 1940s &1950s. 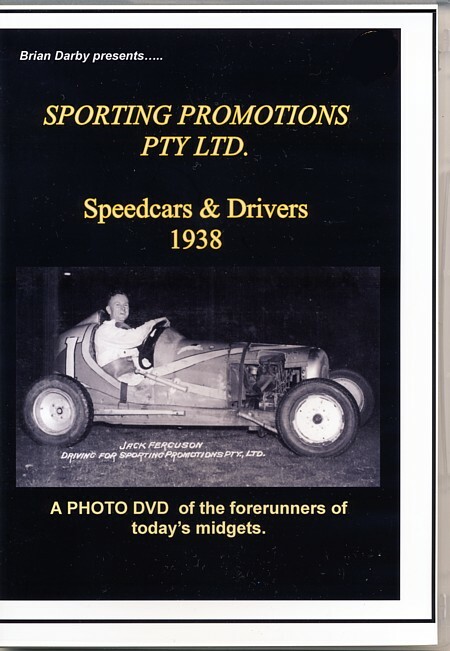 Paul Swedberg in Pit Action and driving his # 18 Offenhauser midget at Penrith Speedway in the 1939- 40 season along with footage of Solos- Sidecars and Big Cars at Penrith. career both in Australia and the UK. Some never having been published before. One for the Jim Airey fan. 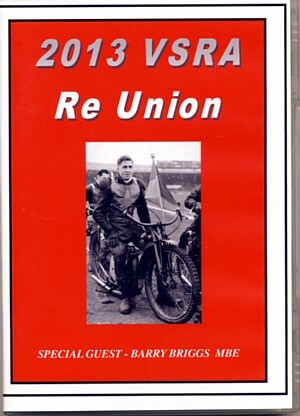 VSRA /ASRA -The Years - A look back at the Re Unions - outings and displays of this Aussie Vets Speedway Association. Details as per DVD cover above. 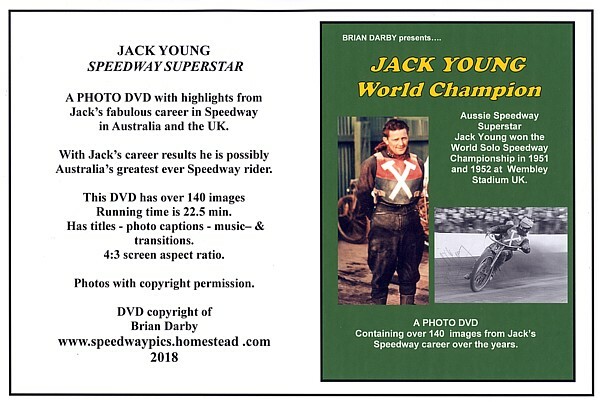 A Photo / Video DVD triple disc set with highlights from the 70 years of Speedway operations at one of the greatest Speedway venues the world has known. The rear of the cover says it all - years in the making. Might sound expensive - but well worth it. 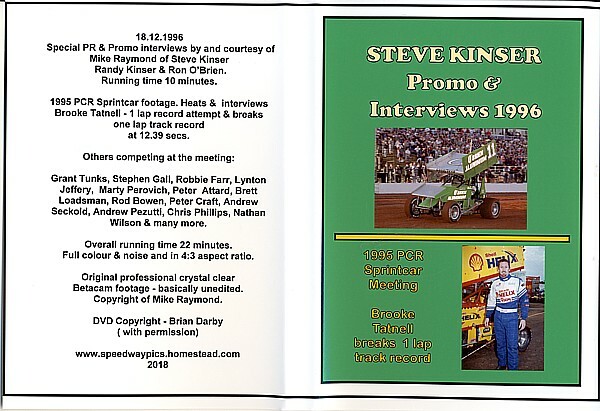 The history - the riders - the drivers - the cars plus highlights from the 'Farewell Meeting' in 1996 plus some Fox studio images and the Plaque and Back to The Royale days in 2000. A bit more than just Jim Airey and Bob Tattersall. 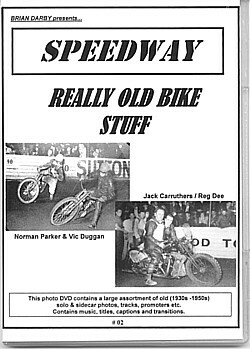 These two DVDs a perfect gift for the Speedway fan of old. 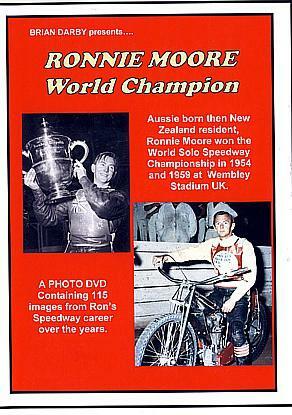 Ronnie Moore - World Champion. 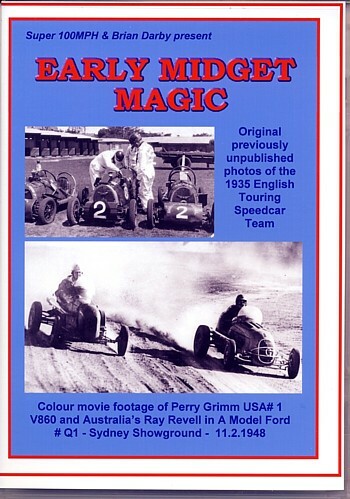 A photo DVD of highlghts from Ron's Speedway career. 115 images - Running time 18 minutes. 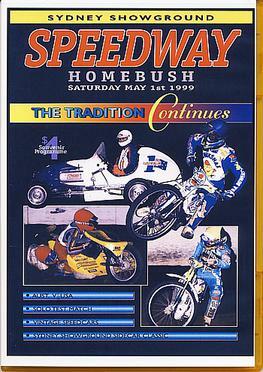 One for the Solo Speedway fan of old. 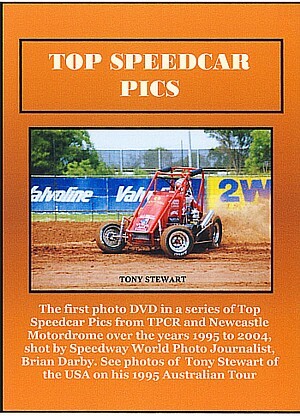 A PHOTO DVD of over 185 original & unique quality photos. 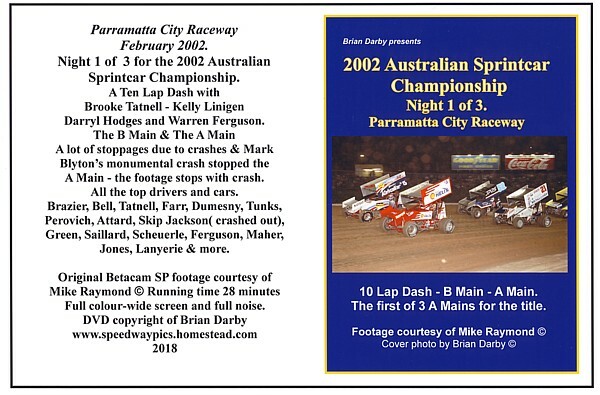 Australian Speedcar Racing - the rear of the cover says it all - only available for purchase from this site - a unique presentation of over 440 historical photos of NSW, Vic., S.A., W.A., Qld. 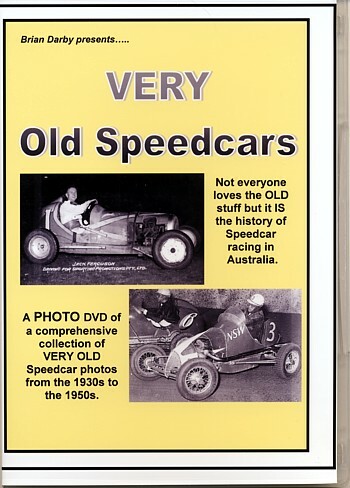 - and International Speedcar drivers and cars who raced in Australia over 7 decades. $ 45 Aud +$ 4 P&P ( within Australia) o/s P&P $ 9 Aud. The rear of the cover says it all - a unique presentation from the Speedway career of one of the world's best ever Solo riders . $ 30 + $ 3 P&P (within Australia) o/s P&P $ 9 . 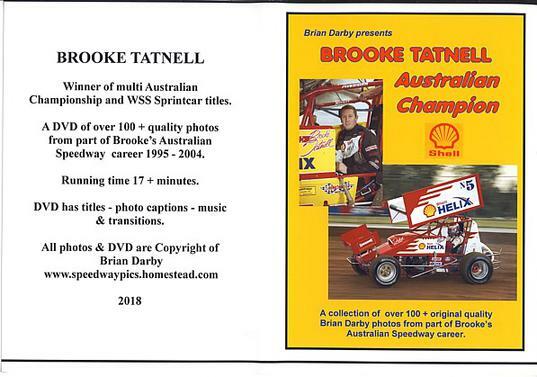 Over 100 quality & unique Brian Darby photos from Brooke's Speedcar & Sprintcar career - years 1995 - 2004 . Bikes and Cars - Australia & Uk. 56 minutes of original video footage. 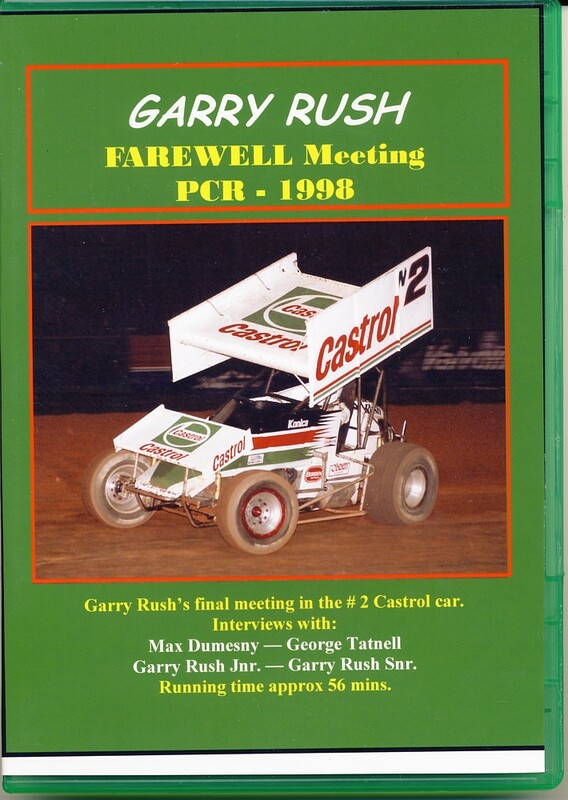 or.. the twin pack - Farewell Meeting & Photo DVD - $ 49.95 + P&P.